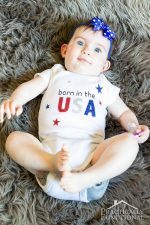 Make A St. Patrick's Day Baby Onesie In Just 5 Minutes! 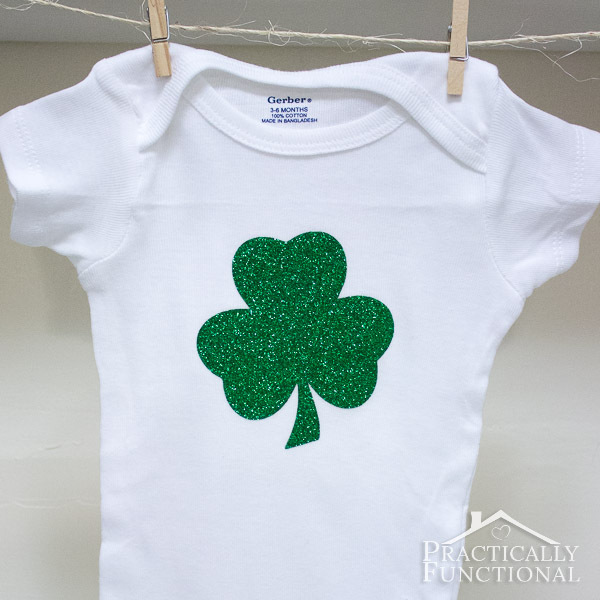 Home > Projects > Crafts > Make A St. Patrick’s Day Baby Onesie In Just 5 Minutes! The full tutorial for making these adorable shamrock onesies is below, but if don’t want to make one yourself, I’ll make one for you! You can find these St. Patrick’s Day baby onesies in my Etsy shop! Are you starting to get ready for St. Patrick’s Day yet? 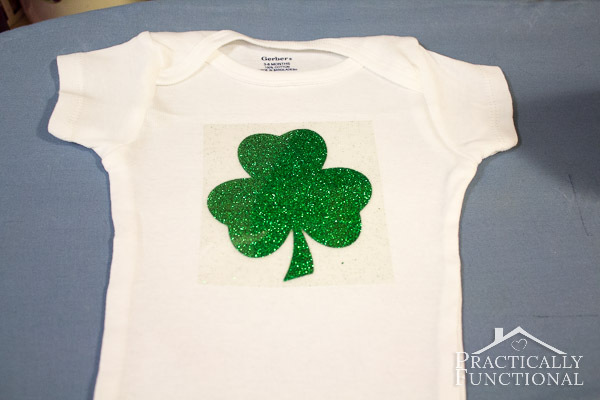 Here’s a perfect five minute homemade gift for any new mom: a St. Patrick’s Day baby onesie! 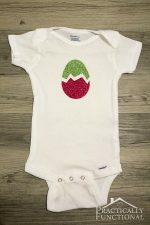 Your baby will be totally ready for the holiday with this adorable, glittery, green shamrock onesie! 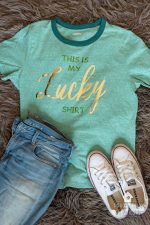 And if you want to make a shirt for yourself, check out this cute “This Is My Lucky Shirt” St. Patrick’s Day shirt! 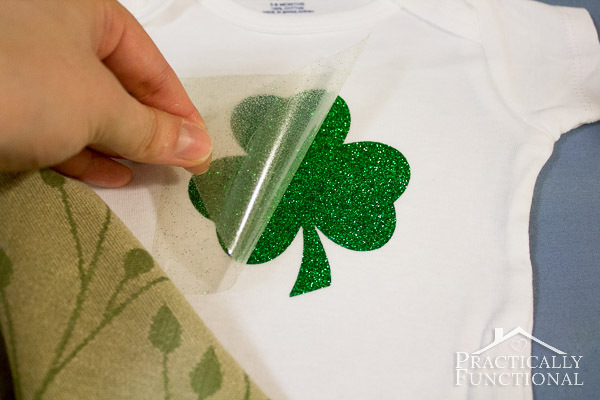 Cut out a shamrock shape from your heat transfer vinyl. If you’re using a Silhouette cutting machine, remember to cut out a mirror image because heat transfer designs go on backwards. 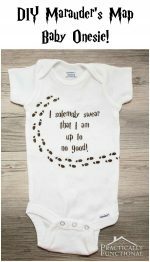 For a shamrock it doesn’t matter that much, but if you want to add words to the onesie, make sure they are mirrored before you cut them out! Once the shamrock is cut out, peel the extra vinyl off of the plastic backing, then place the shamrock plastic side up on your onesie. Heat up your iron, lay a clean hand towel over the shamrock, and press the hot iron down onto the shamrock for 45 to 60 seconds. Gently peel up the plastic backing; if the shamrock comes up with it, put the iron back on for another 15 seconds or so. Once the shamrock is fully stuck, peel the plastic backing off, and you’re done! Quick, easy, and totally adorable! 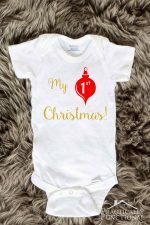 If you want to purchase a baby onesie for yourself, you can do so here in my Etsy shop! I love this. So stinking cute! So super-cute, Jessi! What a lucky little onsie! 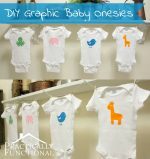 Awh, this post is making me wish my littles are still small enough for onesies! Super cute gift! Adorable! Any suggestions on where I can get the vinyl? Looking for a mainstream store as I need for Saturday so do not have time to order online. Thanks! Hmm, I always order my vinyl online, so I don’t know where to get it in an actual store! I know Michaels and Joanns don’t have it, but maybe Hobby Lobby? Sorry I can’t be more help! Actually Melissa, now that I think about it, you may be able to get the Cricut brand vinyl at JoAnns or Michaels. I know JoAnns sells the Cricut machines, so I’d check there first!